Maxwell Place on the Hudson renews a former industrial site between Hoboken’s historic brownstone row-house district and the Hudson River, reconnecting the community with its long-obstructed waterfront. Before Maxwell House Coffee occupied the site in the 1930s, this area was used as a ball field, known as the historic Elysian Fields. It was here in 1865 that the first known baseball game was played using modern rules. Today, the project borders on Elysian Park to the south and a shipyard redevelopment project to the north, offering tremendous views of Manhattan and the riverfront area. 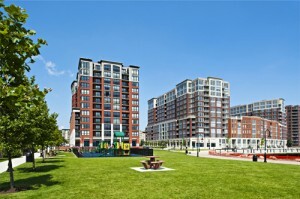 One of the main goals of the redevelopment plan for the site was to reconnect Hoboken to its waterfront as the industrial buildings of the abandoned Maxwell House plant were positioned in a way that cut off access to the river. (In fact, the Eleventh Street Boulevard terminated directly into the solid wall of one of the industrial structures, blocking a major view corridor.) 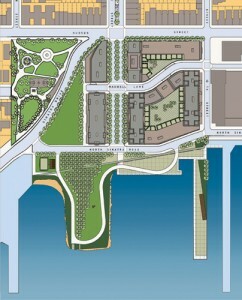 The site plan was derived from an expansion of the existing city grid, creating four new development blocks. This approach ensured that the new development would integrate into the fabric of the city, preserving the right-of-way and view corridors along Eleventh and Twelfth streets to the Hudson River. The design team worked closely with a local waterfront advocacy group and the city to ensure that the water’s edge would forever be a public park and not be a gated community. The Hudson River Waterfront Walkway wraps the eastern edge of the site and provides pedestrian connections to downtown Hoboken and the NJ Transit Center, offering direct access to PATH, rail, light-rail, bus and ferry service. 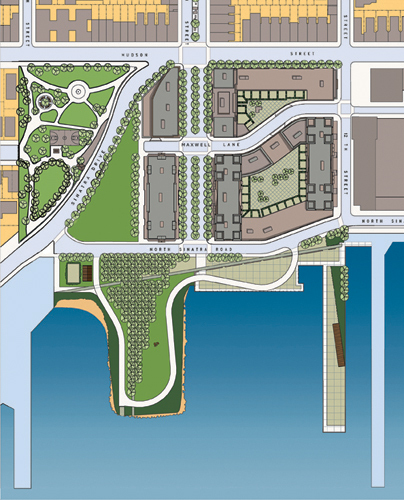 To maintain this connectivity, the Maxwell Place development provides direct access points to the public waterfront esplanade and a new five-acre waterfront park at the river’s edge, which includes the restoration of a former historic beach area now home to the Hoboken Kayak Club. The waterfront plan also includes a converted pier with a free-standing shed for outdoor markets and events. The architectural design of Maxwell Place creates a new urban village on the waterfront with the character and scale of a Hoboken neighborhood. It has a mix of low-rise brownstone buildings combined with several high-rise towers held together with a contextual architecture of brick and stone. At the base of the buildings, commercial retail space reinforces the village-like atmosphere, providing convenient retail services and restaurants. Parking levels are embedded behind theprincipal uses on the lower levels of all the building blocks so that the garages are completely hidden from view. The architectural style is derived from a contemporary interpretation of historic Hoboken architectural elements and traditional materials. These elements are employed in a modern way and include a pattern of bay windows, which create a rhythmic facade on the streetscape; cornices and horizontal cast stone bandings used to pick up the scale of traditional buildings; and a rich palette of brick and cast stone used in alternating patterns to break up the composition into smaller-scale components. Two of the four development blocks are now completed and occupied. The waterfront park, the restored beach, kayak pavilion, pier shed, and waterfront walkway are also completed and open to the community. When fully built-out, the project will include 832 residential units, 1,398 parking spaces and 219,426 square feet of commercial space.